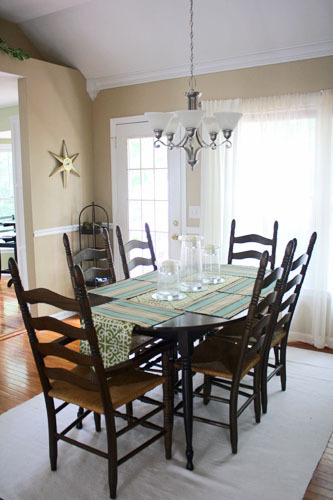 I’m back with the photos of our finished dining room! Well, “finished” is relative in this house, of course, but on the whole the dining room is a much happier place to be now. I am doubly happy that we are no longer eating dinner at the coffee table! Remember, both are reversible! 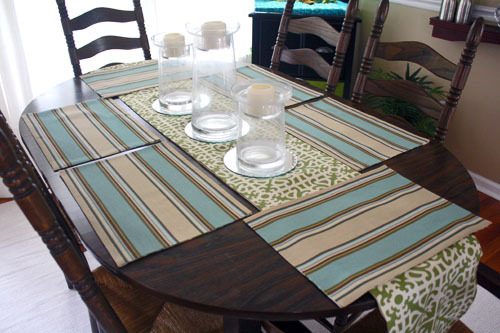 The placemats have the green lattice on the other side, and the runner can be flipped over for stripes. They work well together despite the pattern-mixing because the stripes have the same green from the lattice pattern (it’s a little hard to see in the photos, but it’s there). And YES, yes, I should probably put something in my candle centerpiece thingies. I know. It’s just that I have this serious aversion to “vase filler” and “potpourri” and whatnot like that. They all feel too much like junk just for the sake of junk, and I think I’ve pretty well established that I cannot handle junk. And anyway, it seems like the table has enough going on now, with all the patterns and mirrors, that I can get away with them empty for now. Boom! My favorite RITVA curtains and the ERSLEV rug from IKEA! Good grief, how bright is the room now with those? This is that glorious time in my life, pre-children, that I can get away with a white rug, so by golly I will have a white rug. We’ve gone a week without spilling anything yet! Of course we never spilled anything in the dining room before, with just the hardwood floors, but now that we’re tempting fate it’s bound to happen. But not yet! So I love it! And the RITVAs are exactly the same guys that we have in our bedroom. Am I boring for hanging white curtains throughout my house? I can’t help it, even if I am. They just make the room so bright! There’s the aquarium! You can barely see the little green skirt I made peeking out, which is just how I want it. The orange and blue buckets hit your eyeballs every time, but now the green just blends in with the rest of the room. Yay! The inherited dining room table is still not totally my thing. But for now it does its job well, so I am not complaining. 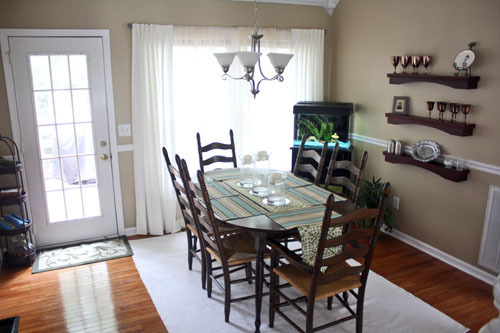 I have visions of perhaps refinishing the chairs in black and getting a pedestal table and... you know what? Nevermind. I am just going to enjoy the room as-is for now! And finally: YES, I realize that I need to polish our silver. Seriously, what twenty-somethings have silver? I cannot be trusted to keep heirlooms looking nice. So what do you say we have a little before and after? 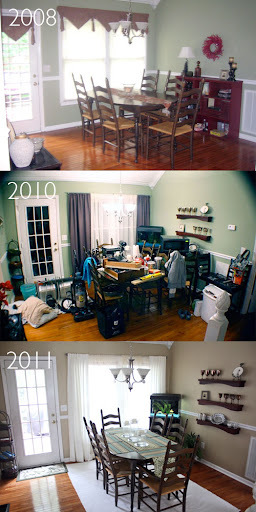 Or better yet, Dining Room, Throughout the Ages: A Retrospective? Oh my goodness, you guys, I love it so much! 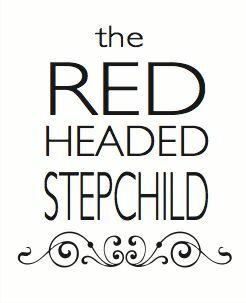 I love passing through it to all the main rooms of our house (living room AND kitchen AND master bedroom AND entryway). Even though it isn't perfect, it finally feels worthy to be the first room you see when you come upstairs to the main level of our house. And dining has never been so fine in our home before!